Yes, and I tried N = 100 and N = 1000. It really didn't make much difference for the scalar results; the bivector "residue" just goes to more vanishing with higher N. But this simulation is a great demonstration that Joy's model does indeed predict that E([b]a, b[/b]) = [b]-a.b[/b]. You may find the explanation here: http://challengingbell.blogspot.co.uk/2015/03/numerical-validation-of-vanishing-of.html. See the formula for the "res." It sums from 0 to N-1. In probability theory one usually sums N+1 terms, from 0 to N, for a sample mean. But in simulations, according to Albert Jan, it is more convenient to sum over N terms, from 0 to N-1. I have extended Albert Jan's simulation to 9 degree increment resolution. Probably not much point in going further with it since we know the result of Joy's model is [b]-a.b[/b]. Given EPRB as per the topic heading (and with its spin-half particles or with the photonic variant), [b]the state is spherically-symmetric[/b]. So the detector settings [b]a[/b] and [b]b[/b] can be widely varied over 3-space and certainly [u]neither[/u] need be anywhere near orthogonal to the line of flight: yet (under all variants) the Expectation remains as E([b]a[/b], [b]b[/b]) = cos 2[i]s[/i] (π ± ([b]a[/b],[b]b[/b])) where [i]s[/i] denotes the relevant intrinsic spin and ([b]a[/b],[b]b[/b]) denotes the angle between the detector settings. I'd welcome your comment; me now wondering about the strength of the model being used and/or the versatility of the [b]GA[/b] Viewer? Not really what I was saying. Joy's model is very robust and uses fully 3D [b]a[/b] and [b]b[/b] vectors to establish the main result of E(a, b) = [b]-a.b[/b]. 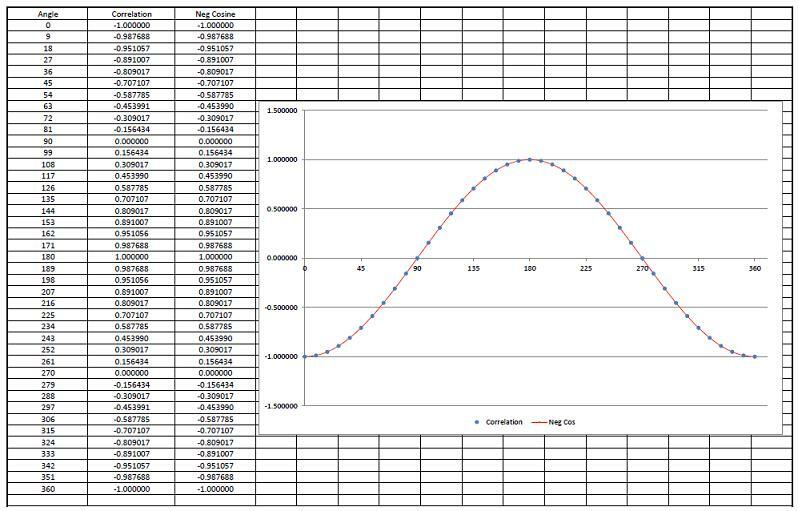 However you will find out with any model that you will get the [u][b]best[/b][/u] correlation for an experiment or simulation with those vectors 2D and othogonal to propagation. And... most experiments and the QM prediction use [b]a[/b] and [b]b[/b] that way. And for typical experiments, it is the polarizers not the detectors that are varied. [quote="FrediFizzx"][quote="Gordon Watson"]Fred, this sentence has me confused: "[u]And this is like it would be in a typical experiment; they can never get those vectors to be perfectly in the same 2D plane[/u]." [quote="Gordon Watson"]Fred, this sentence has me confused: "[u]And this is like it would be in a typical experiment; they can never get those vectors to be perfectly in the same 2D plane[/u]." We have found via doing these simulations with GAViewer that the perfect correlation happens if the [b]a[/b] and [b]b[/b] vectors are perfectly aligned perpendicular to the propagation axis. Which is a good thing because it is definitely easier to work with them being 2D instead of 3D. Fred, this sentence has me confused: "[u]And this is like it would be in a typical experiment; they can never get those vectors to be perfectly in the same 2D plane[/u]." Could you elaborate please: What is the niggle that arises, in the model and in practice, with respect to the two detector settings; [b]a[/b] (set by Alice) and [b]b[/b] (set by Bob)? [quote="Joy Christian"]Here is a link to the original simulations by Albert Jan and Fred, for those who are unaware of the history: http://challengingbell.blogspot.co.uk/2015/05/further-numerical-validation-of-joy.html. 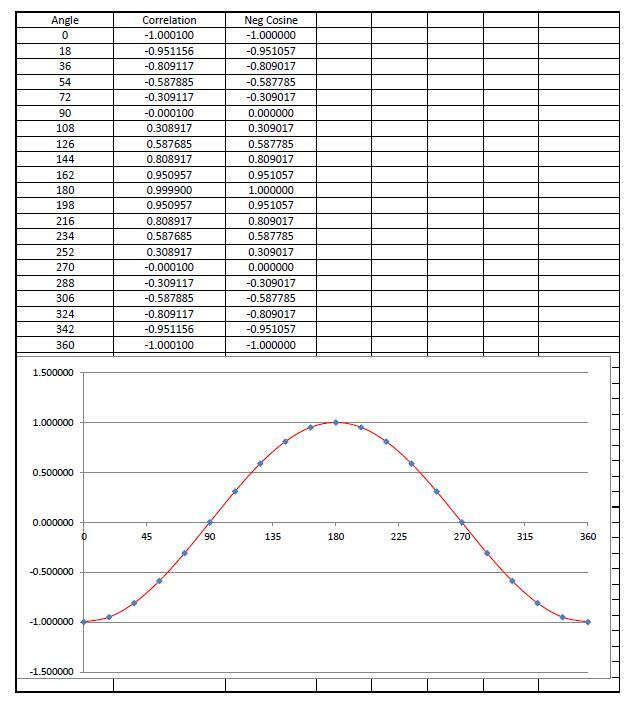 Here is a link to the original simulations by Albert Jan and Fred, for those who are unaware of the history: http://challengingbell.blogspot.co.uk/2015/05/further-numerical-validation-of-joy.html. Sadly, the revolution actually happened way back in 2007, but the physics community has yet to catch up: http://arxiv.org/find/all/1/au:+Christian_Joy/0/1/0/all/0/1.